The non-contact method means that there is no possibility of impact damage to the workpiece. The VERMES MDS 3010+ and MDS 3020+ micro dispensing jetting valve systems are jetting valves for precision dispensing of material in small volumes at fast speeds with extremely high accuracy and repeatability. 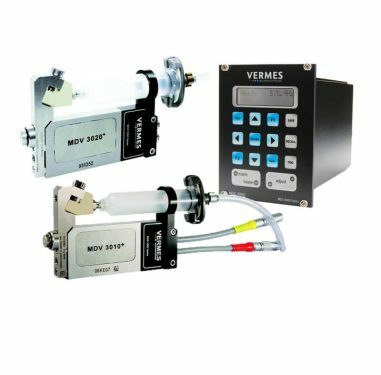 Based on piezoelectric fluid jetting technology, the VERMES MDS 3010+ and MDS 3020+ allow for contactless application of materials at high speed with precision at a faster dispensing rate than those of pneumatic valve technologies. The VERMES MDS 3200+ is recommended for micro dispensing medium to high viscosity materials up to 2,000,000 mPas in repeatable single dots or beads of ≥0.5 nl. Example fluids include SMT adhesives, conductive adhesives, silicones, LED phosphor, underfills, hot melts and solder pastes. The VERMES MDS 3280 is recommended for dispensing medium to high viscosity materials up to 2,000,000 mPas in repeatable single dots or beads of ≥0.5 nl. Example fluids include SMT adhesives, conductive adhesives, silicones, LED phosphor, underfillers, hot melts and solder pastes.